Las Vegas as we know it was started by a gangster. This may come as no real shock to you, given Las Vegas’ reputation as a place to do shady things. But it wasn’t just any gangster that started the modern iteration of Las Vegas. It was one of the most over the top, silliest and brutal gangsters ever committed to that lifestyle. Bugsy Siegel had a vision and he was unwilling to compromise, despite what his gangster bosses said. This is his story. While this movie is about him conceiving of the Flamingo, the first big hotel and casino in Las Vegas, it is also about his torrid love affair with Virginia Hill. Upon arriving in Los Angeles, Bugsy meets Virginia on a movie set and falls in love with her. The only problem is that he is already married with two kids. Regardless, he makes permanent plans to stay in Los Angeles and treat his lover like the goddess she is. Except he is also a brutal killer who is uncompromising in his approach to doing business. He may throw money around but he isn’t find new channels of bringing in the cheddar. On a trip to one of the rundown gambling saloons held by his gangster family, he gets a spark of inspiration from Virginia. Why not build an opulent casino and get famous people to perform there to bring the customers in? He brings the idea to his bosses and they bank roll the project, giving him a million dollars. From the get go, the project goes over budget and the costs soar. Virgina is tasked with helping Bugsy realize his vision and becomes a shrewd businesswoman. But his bosses are not happy. After sinking millions of dollars into the structure, it is barely ready to go on Christmas day. Of course this hotel is destined to not do well on its first day. A thunderstorm rips through Las Vegas, creating no business for it. Bugsy has now angered the mob bosses. Further more there is evidence to suggest that Virginia has been stealing from the operation the whole time. Bugsy refuses to believe the rumors, proving that he loves his girlfriend blindly. He pays for his love with his life. The Flamingo goes on to be one of most profitable ventures in mob history. Warren Beatty and Annette Bening had met several years before working on this film, but they married shortly after the wrapping of production. This charisma and sexual tension translates to a great back and forth as they play Bugsy and Virginia Hill. Unfortunately the screenplay doesn’t live up to this palpable potential. The story spends way too much time setting up who Bugsy is and very little time showing what Bugsy does. His dichotomy between ruthless gangster and petty ladies man grows repetitive. I can see that he is vain and petty by his sharp clothing and brief scene of him tanning his face, but do we need to see it illustrated again and again for no reason? In contrast, we spend very little time with Virginia Hill. Her story is the one that is probably the more interesting of the two, because she is the reason that Bugsy ends up getting killed. But her motivations are never really explained and her background is never fleshed out. 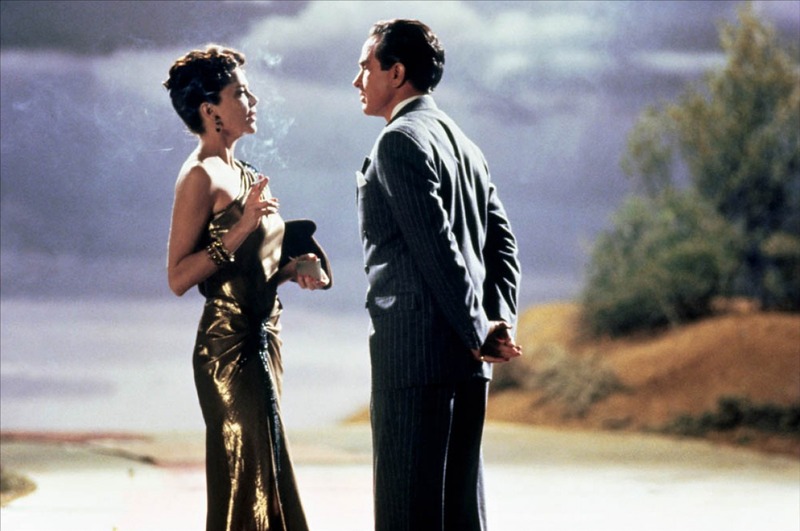 Her first appearance on-screen is contrived (the first day Bugsy lands in Los Angeles, he goes to the set of his movie star friend and sees her in a bit part) and she continues to be a contrived almost vixen for the rest of the movie. She seems to give Bugsy a hard time and demands a lot from him, but she never seems to love him. Is she more attracted to his money or to him? I would have liked an answer to the question. There was so much potential for a great movie here and it was spoiled by the bloated writing and directing. I wish I could have liked this slogfest more, but it just couldn’t hold my attention at all. I don’t have a lot to say about it because it is a nothing of a movie. I instantly forgot most of what happens in the movie the moment after I turned it off. I would only watch this movie if you are fascinated by mob history and Las Vegas history and don’t mind being bored for the rest of it.